"A right teddy bear's picnic this has turned out to be." If we go back to 1969 and 1970, we find America in the midst of the unpopular Vietnam War, where blood and mayhem was brought into our living rooms on a daily basis. More than anything else, seeing what war is like turned people against it. Of course, 30 years later things have moved to the other side of the circle again, and war is regularly glorified and presented as bloodless and fun. So it's a welcome jolt to have this little-known movie by Robert Aldrich (The Dirty Dozen) brought back from oblivion by Anchor Bay. As John Ford once noted, all war movies, properly made, are anti-war movies. Too Late the Hero presents an unsettling allegory of Vietnam under the setting of World War II, much as M*A*S*H did the same thing using the Korean War. Cliff Robertson stars as translator Lt. Sam Lawson. He signed up for the military in order to use his linguistic skills and stay safely in the background. 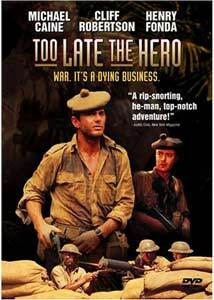 That all changes in the Spring of 1942 when Captain Nolan (Henry Fonda) orders Lawson to join a British combat unit in the New Hebrides for a cooperative mission. On reaching the island where the British are holed up at one end, with the Japanese controlling most of the rest of the island, Lawson learns that he has been volunteered for a suicide mission to knock out a Japanese radio transmitter and then transmit false orders in Japanese. Leading the group is Captain Hornsby (Denholm Elliott). Among the soldiers is a young Michael Caine as Private Tosh Hearne. Despite his refusal to get involved, Lawson ends up with no other options than to be 'heroic.' The mission of course goes badly, and the Japanese commander taunts the survivors to give themselves up, working a psychological battle of wills against the allies as they turn on each other. All the horrors of war are here, with violent, bloody and sudden death out of nowhere. Worse still, the deaths are often unnecessary, caused by incompetent commanders and friendly fire. Even the supposed heroes have feet of clay, robbing and mutilating corpses, betraying each other and killing prisoners as they go. Lest the Vietnam analogy escape the viewers, Hornsby at one point vilifies Lawson's cowardice as being comparable to that of a "long-haired conscientious objector." Though the film is lengthy, it really could have been longer. Lawson's character arc is far too abrupt to be believable. The loathing of the enlisted men for their commanding officers is a nice touch that helps keep the suspense factor going strong as the British and Lawson try to evade the Japanese. Caine does a good, understated job of growing from irritation at Lawson to a grudging admiration. Denholm Elliott is superb as the captain who doesn't have the respect of his men, nor the abilities to lead. The camera work is often shaky, giving the picture a documentary look not unlike the Vietnam news footage. The long, climactic sequence is expertly intercut to maximize suspense and excitement and works quite well. Though at times this feels a little like a rehash of The Lost Patrol, it's still interesting to watch and definitely holds the interest for the entire running time. Image Transfer Review: The original widescreen aspect ratio is presented in anamorphic mode, with plenty of detail and good color. There are loads of speckles, dirt and grain, especially near the frequent reel changes. There are also a few jumps in the picture. However, other sections of the film look perfectly fine. Since this was originally a film made by ABC Television (for theatrical release, however, not TV), the elements may not have been given the proper care. It's certainly acceptable, but not the stellar quality we're used to seeing from Anchor Bay. The second layer also includes a pan & scan version of the movie, about which the less said, the better. I would much have preferred that Anchor Bay clean up the primary widescreen transfer than waste their time fitting the picture to a television screen. Audio Transfer Review: The Dolby Surround track sounds pretty good. Bass levels are okay but extension is lacking. There is plenty of activity in the surrounds during the jungle sequences and combat. The music also dominates the surrounds. Dialogue is unfortunately often unclear due to the thick regional British and Scottish dialects being used. There is a fair amount of noise and hiss as well. The feedback from the Japanese sound systems is absolutely piercing, so listening at high levels is not recommended. Extras Review: Not much. A TV spot is about it. The lack of subtitles is highly frustrating in view of the problems I had understanding the dialogue. The chaptering is good. An interesting WWII-as-Vietnam allegory with a good deal of excitement going for it as well. Though the source material isn't in the best condition, it's still worth a rental.